Robert L. DuPont, M.D., Theodore V. Parran, Jr., M.D., and Bonnie B. Wilford, M.S. Jeffrey Fudin, Pharm.D., DAIPM, FCCP, FASHP, Jacqueline Cleary, Pharm.D., BCACP, Courtney Kominek, Pharm.D., BCPS, CPE, Abigail Brooks, Pharm.D., BCPS, and Thien C. Pham, Pharm.D. Theodore V. Parran, Jr., M.D., John A. Hopper, M.D. and Bonnie B. Wilford, M.S. Jason Baker Fields, M.D., DABAM and Yngvild Olsen, M.D., M.P.H. John A. Hopper, M.D., and Theodore V. Parran, Jr., M.D. Karen Muchowski, M.D., FAAFP and Steven R. Hanling, M.D. Nelly Buckalew, M.D., N.D., M.S., M.S.L., Rachel Maree, M.D., M.P.H., Zachary Marcum, Ph.D., Pharm.D., and Debra K. Weiner, M.D. Ilene R. Robeck, M.D., Stephen C. Hunt, M.D., M.P.H., Lucile Burgo-Black, M.D., FACP, Jeremiah McKelvey, Pharm.D., Afreen Siddiqui, M.D., and Anthony J. Mariano, Ph.D.
Dr. Ilene R. Robeck, MD, FASAM is an internist/addictionologist with a special interest in chronic pain treatment in primary care as well as the approach to the patient with chronic pain with comorbid substance abuse, mental health concerns and/or complex medical problems. She is currently the Director of Virtual Pain Care at the Richmond VA Medical Center. She is also Co-Chair of the National Primary Care Pain Task Force and Past President of the Florida Society of Addiction Medicine. ; Dr. Herbert L. Malinoff, MD, FACP, DFASAM is the president and founder of Pain Recovery Solutions, PC. He specializes in treating patients with chronic pain syndromes, addiction, and in detoxification as well as internal medicine needs. . Dr. Malinoff lectures internationally on Chronic Pain and Addiction and is an active member of the American Society of Addiction Medicine where he co-chairs the Pain and Addiction-Common Threads Course. He is a Fellow of both the American College of Physicians and the American Society of Addiction Medicine. Dr. Malinoff is an attending physician at St. Joseph Merch Hospital in Ypsilanti and is on the faculty of the Department of Anesthesia at the University of Michigan Medical Center. ; Dr. Melvin I. Pohl, MD, DFASAM is a Board-Certified Family Practitioner. He is the Chief Medical Officer of Las Vegas Recovery Center (LVRC) and was a major force in developing LVRCs Chronic Pain Recovery Program. Dr. Pohl is a Clinical Assistant Professor in the Department of Psychiatry and Behavioral Sciences at the University of Nevada School of Medicine. He is the author of A Day without Pain, revised edition and The Pain Antidote - Stop Suffering from Chronic Pain, Avoid Addiction to Painkillers, and Reclaim Your Life. Dr. Pohl filmed a show for PBS on chronic pain which aired around the country in 2016.; Dr. R. Corey Waller MD, MS, FACEP, DFASAM is an addiction, pain, and emergency medicine specialist and the Senior Medical Director for Education and Policy at the Camden Coalition of Healthcare Providers (CCHP). Dr. Waller earned a Masters of Science in neuromolecular biology at Southwest Texas State University and earned his Medical Degree at the University of Texas Medical School in San Antonio. Dr. Waller completed his Emergency Medicine residency at Thomas Jefferson University in Philadelphia and is board Certified in Emergency Medicine and Addiction Medicine. ; Dr. Michael F. Weaver, MD, DFASAM is Professor of Psychiatry at The University of Texas Health Science Center at Houston. He completed a Residency in Internal Medicine and a Clinical Research Fellowship in Addiction Medicine at Virginia Commonwealth University. He is involved in patient care, medical education, and research. Dr. Weaver has multiple publications in the fields of addiction medicine and pain management. ; Dr. Mark A. Weiner, MD, DFASAM earned his medical degree at Cornell University Medical College in New York City. He completed his internship and residency in Internal Medicine at Northwestern University McGaw Medical Campus in Chicago, Illinois. At St Joseph Mercy Hospital Ann Arbor, he is the Medical Director of Substance Use Disorders, the Section Head of Addiction Medicine, Program Director for the Addiction Fellowship and Medical Director of IHA Pain Management Consultants. 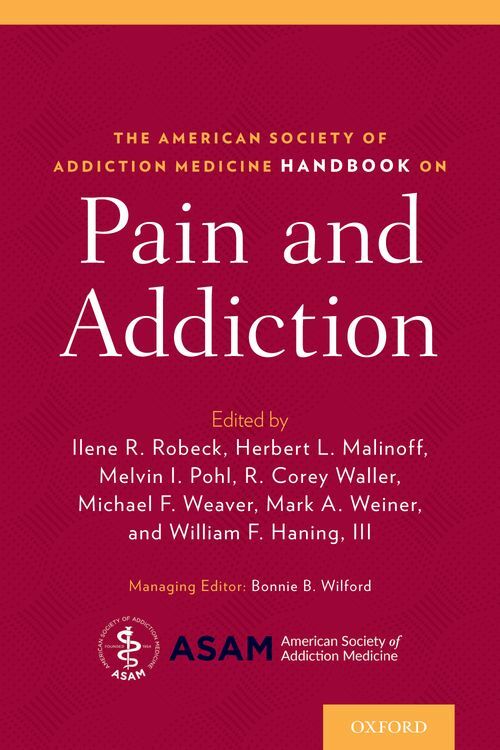 He is the chair of the planning committee of the American Society of Addiction Medicine course, Pain and Addiction: Common Threads and the Pain and Addiction Education Expansion Task Force. ; Dr. William F. Haning, III, MD, DFASAM, DFAPA is a physician and tenured Professor of Psychiatry, retired, at the John A. Burns School of Medicine, University of Hawaii. He is the Past Director of Medical Doctorate Programs for the school and remains Director of Addiction Psychiatry/Addiction Medicine. He serves as a Director-at-Large of the American Society of Addiction Medicine (ASAM); Chair of the Examination Committee for Addiction Psychiatry, American Board of Psychiatry and Neurology (ABPN); current Chair, ASAM Publications Council; and the Editor-in-Chief of ASAM Weekly. ; Bonnie B. Wilford, MS, is Executive Vice President of the Coalition On Physician Education in Substance Use Disorders (COPE), an organization dedicated to improving the education of all medical students by increasing the attention given to substance abuse and related disorders. She has also served as a section editor for multiple editions of ASAMs Principles of Addiction Medicine, managing editor of several editions of the ASAM Patient Placement Criteria, and a frequent contributor to medical journals and UpToDate. Her work has been recognized with awards, including the AMAs Distinguished Service Award and ASAM's Presidents Award for Lifetime Achievement in Addiction Education. ; Bonnie B. Wilford, MS, is Executive Vice President of the Coalition On Physician Education in Substance Use Disorders (COPE), an organization dedicated to improving the education of all medical students by increasing the attention given to substance abuse and related disorders. She has also served as a section editor for multiple editions of ASAMs Principles of Addiction Medicine, managing editor of several editions of the ASAM Patient Placement Criteria, and a frequent contributor to medical journals and UpToDate. Her work has been recognized with awards, including the AMAs Distinguished Service Award and ASAM's Presidents Award for Lifetime Achievement in Addiction Education.